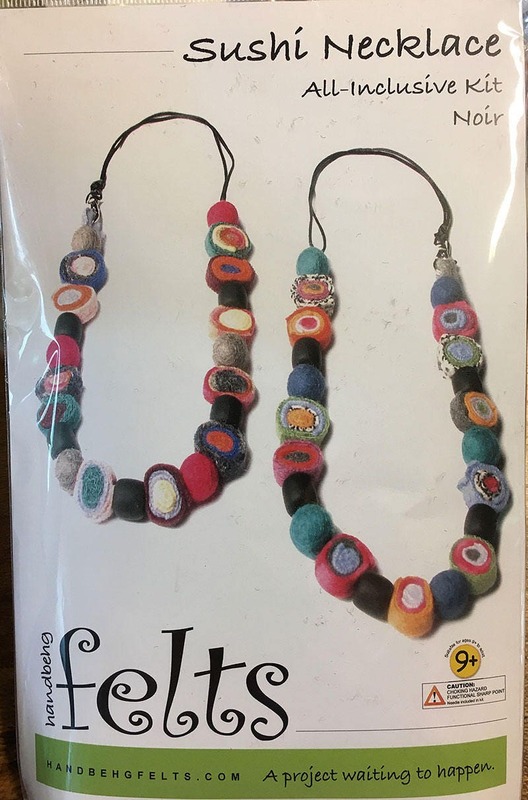 Sushi Necklace kit - make a lovely wearable piece of fiber art! Each kit offers a delicious mix of felt balls and salvaged wool for a one-of-a-kind jewelry art piece. Kit Noir (black) color. Thanks for visiting my shop! Please come back again! To fulfil your order, you must provide me with certain information (which you authorized Etsy to provide to me), such as your name, email address, postal address, payment information, and the details of the product that you’re ordering. I may store and process your information through third-party hosting services in the US and other jurisdictions. As a result, I may transfer your personal information to a jurisdiction with different data protection and government surveillance laws than your jurisdiction. *If a customer contacts you to access, correct or delete personal information held by Etsy, you may contact Etsy at Etsy.com/help for assistance, or request that the customer send a request directly to Etsy. We are a retail shop and not a wholesaler, so we do not offer bulk or wholesale prices. We do, however, offer sales and coupon codes that will benefit our customers. Our prices are very competitively priced. What if I have 2 or more open orders - will they ship together? When multiple orders from the same buyer are received, we will make every attempt to ship them together, but it is NOT guaranteed. Do you offer coupon codes? Yes! Please enter Coupon Code in your cart PRIOR to check out. Coupon Codes cannot be applied retroactively or on custom orders ~ must be entered in the coupon code section of your shopping cart - NOT in the 'note to seller'. Thank you! Only one coupon code per order. Can I call you about my order? Sure, but if you feel you do need to call me about your order please call Monday through Saturday between the hours of 10am and 6 pm CST. Sorry, but we do not. As a small business we have expenses and are frequently operating on a wing and a prayer! We will, however, adjust your shipping and send a refund if you have overpaid on your shipping. Contact us if any questions about your shipping cost! Can I exchange this item for something else? We do not accept exchanges, but if you need to return the item, contact us within 5 days of receipt for approval, and return the item within 7 days of receipt. Refund will be for the cost of the items only, not the shipping. Can I use more than one coupon code or offer? We offer many ways to save on your order, however only one offer or coupon code may be used per order. Etsy does give you the offer or code that gives you the best price overall when you check out! Can items that are on Clearance be returned? No, when we put something on clearance, we need to make room for new products. Items are new and perfectly good, but we only have so much room for inventory. My pre teen granddaughter loved these kit components!